Mental health crises occur when our ability to cope is overwhelmed by the internal and external stressors in our life. Sometimes crises are related to inner experiences like worsening depression, mania, psychosis or other symptoms of a mental health condition. Sometimes they are in reaction to an external stressor like trauma, divorce or intense grief. Often times it’s many things coming together in a point in time. For whatever reason, in that moment, people often feel unable to resolve the situation with the resources they have and feel out of control and hopeless. Here’s one thing you should know: Crisis can happen to anyone. One common symptom of people in this temporarily heightened state of emotional distress is agitation where people have trouble sleeping or thinking straight. One way people try to cope with these uncomfortable feelings are by self-medicating by consuming alcohol or drugs. Others may isolate and shut down. Still others may seem to be much more irritable that usual and they may find themselves reacting violently. When the emotional intensity becomes so unbearably painful, people think about suicide. Crisis services are our safety nets. The people who offer support here are our angels behind the curtain. As the Crisis Text Line says, “The goal of crisis services is to help someone move from a hot to a cool moment.” People who are trained to help de-escalate emotional crises listen to the callers and help them create a plan to stay safe for now. The crisis support is not only there for the person in crisis, but for the people who are worried about someone. Today’s podcast will explore the day in the life of a crisis support center — how it works, what to expect if you or someone you care about needs some help getting back on track. My interview with Jennifer Battle explores the social justice roots of the evolution of crisis support services and her deep gratitude for the work she does every day. National Suicide Prevention Lifeline has 159 call centers in 49 states in the US and provides a 24/7, toll-free hotline available to anyone in suicidal crisis or emotional distress. The National Suicide Prevention Lifeline is independently evaluated by a researchers from Columbia University. Call volume to the National Suicide Prevention Lifeline has grown significantly since the inception of the Lifeline in 2005. Between 2016 and 2017, calls increased 32% and over two million calls were answered. There are a number of factors contributing to the 2017 call volume increase including more awareness of the Lifeline number through social/public health messaging efforts (ex. BeThe1to campaign), the release of Logic’s rap song entitled “1-800-273-8255,” his performance of the song at the 2017 MTV Video Music Awards and the 2018 Grammy Awards. When the first season of 13-Reasons Why aired in 2017 this may have also contributed the the influx of calls. Finally the Lifeline number is often highlighted following the deaths of high profile individuals such as musicians Chris Cornell (Soundgarden), Chester Bennington (Linkin Park), Kate Spade and Anthony Bourdain, and this promotion is likely to contribute to continued call volume increases. The Crisis Text Line has had over 83,421,416 messages exchanged since August 2013. Every person to texts the Crisis Text Line is connected with a Crisis Counselor, often in less than 5 minutes. The Crisis Counselor then engages in active listening and collaborative problem solving to help them develop a plan to cope. All of Crisis Text Line's Crisis Counselors are volunteers, donating their time to helping people in crisis. 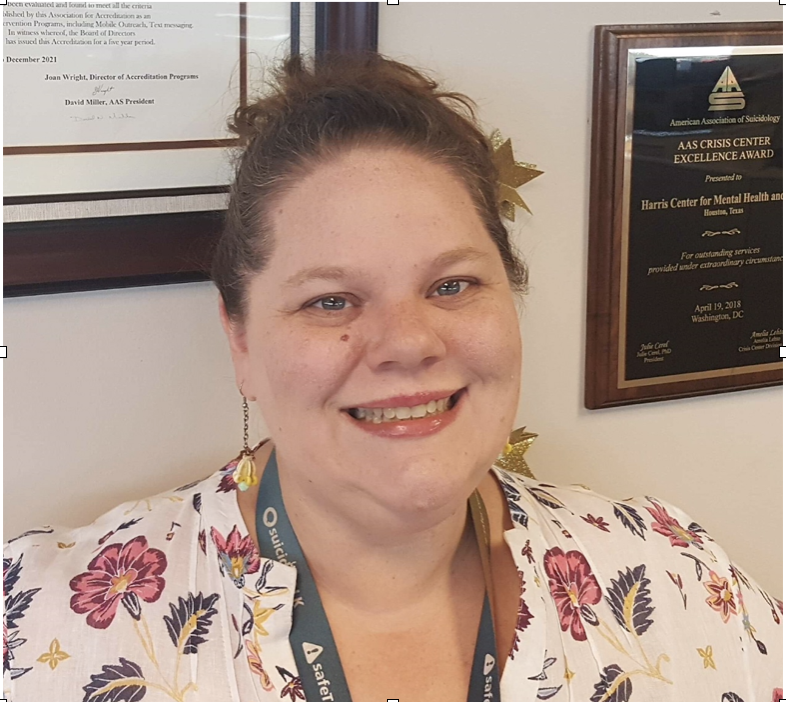 Jennifer is a proud social worker and Program Director in the Comprehensive Psychiatric Emergency Program at The Harris Center for Mental Health in Houston, Texas. Jennifer oversees The Harris Center Crisis Line which serves as the crisis line for 34 Texas counties. The Harris Center Crisis Line partners with the National Suicide Prevention Lifeline as well as the national Crisis Text Line. In collaboration with the Houston Police Department, Houston Fire Department, and Houston Emergency Communications Center, Jennifer supervises the Crisis Call Diversion Program. This team routes people calling in through emergency services who have stated they have a mental health concern away from a law enforcement or EMS response and to a more appropriate level of care through local behavioral health options. In addition to her work at The Harris Center, Jennifer serves as the President of the Board for the National Association of Crisis Organization Directors (NASCOD) and is the past Co-Chair and current member of the Texas Suicide Prevention Council. She serves on the Steering Committee for the National Suicide Prevention Lifeline. Please feel free to share this graphic. All we ask is that you link it back to this podcast and landing page.